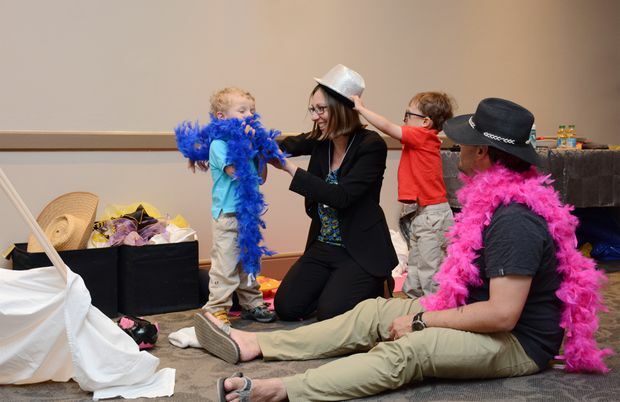 Simon Trudel and Julie Lefebvre, professors in the chemistry department at the University of Calgary, play with their children Alexandre Trudel (red shirt) and William Trudel (blue shirt). Simon Trudel and Julie Lefebvre, professors in the University of Calgary’s chemistry department, have been attending conferences in their chosen field for 15 years. It was never a hassle until three years ago, when they had twins. Suddenly, it became a logistical nightmare: Who would go and who would stay home to look after the boys? Since conferences are de rigeur for academics to keep up with developments in their field – therefore important to both Trudel and Lefebvre – it often came down to a toss of a coin. This year, the couple were both able to attend the annual conference for the Canadian Society for Chemistry (CSC) held in Edmonton last month, a feat made possible because the organization offered daycare for the first time. The CSC’s subsidized onsite daycare at their annual meet-and-greet is still the exception, not the rule for annual gatherings of industry, academia and special interest groups. Françoise Guilluy, senior project manager with International Conference Services Ltd. in Vancouver – whose company handles 15 to 20 conferences annually, with numbers ranging from 200 to 10,000 – says the number of companies who offer this service is spotty at best. CSC president Kim Baines – who describes her industry as “very good at doing reports, having task forces, but … not very good at making change” – decided to act on offering daycare at their conferences because their members asked for it. She’s hopeful that offering childcare will allow more women and minorities greater flexibility to attend, and thereby increase their overall presence and heft at national events, including as plenary speakers. “I’ve been going to conferences for 35 years and all-male panels – or ‘manels’ as they’re called – are a big issue,” Baines says. “At the Bachelor of Science level in chemistry the male-female ratio is 50-50, but at the faculty level it’s still only 30-per-cent female. Sherry Bondy, an Essex town councillor in Southwestern Ontario, is also advocating for daycare at annual conferences of the Association of Municipalities of Ontario (AMO). In February, the mother of three (12, 2 and three months old) brought forward a motion asking AMO and the Federation of Canadian Municipalities to provide user-pay daycare for attendees. It’s still being debated. A few Ontario municipalities are against the proposal, citing cost. But Bondy says it’s not going to cost taxpayers anything because she’s proposing a user-pay system. “I’ve only made four conferences in the last eight years because my partner and I just couldn’t swing it. He’d have to take a week off work, and use up valuable vacation time. I’d happily pay $50 for daycare to be able to attend,” she says. Baines says the CSC increased their conference’s registration fee a minimal amount to subsidize the cost of daycare. There was no push back. Trudel and Lefebvre paid $30 a day, an amount that Trudel says he and his wife were “thrilled” to pay to have the peace of mind and flexibility for both of them to be able to attend. Welcome to The Globe and Mail’s comment community. This is a space where subscribers can engage with each other and Globe staff. Comments that violate our community guidelines will be removed. How worried should parents be about apps and websites collecting children’s data?